The citrus industry has called Florida home, dating back to the early 1500's, when Spanish explorers planted the first orange trees in St. Augustine, Florida. Unbeknownst to them at the time, the planting of those orange trees would become the birth of an industry that grosses billions of dollars every year and feeds the appetite of a country thirsting for the best tasting oranges available. For centuries, farming, and citrus growing, has been predominantly a man's industry. But one entrepreneur and mother of two has been trailblazing her way into the hearts and health of Americans everywhere with her squeezed fresh juices - and her mission to keep families healthy. Her name is Marygrace Sexton, CEO of Natalie's Orchid Island Juices, and her dream began as a young mother when she was taking a walk through the orange groves with her baby daughter, thinking about the ways in which she could provide healthy juice to her baby. It was at that moment Sexton decided to start the family juice company, and name it after her daughter Natalie. Her husband Bobby, a fourth-generation citrus grower, was all for it, in fact it was something he had thought about for years as well, but was too busy running the family citrus packinghouse to see the idea through. 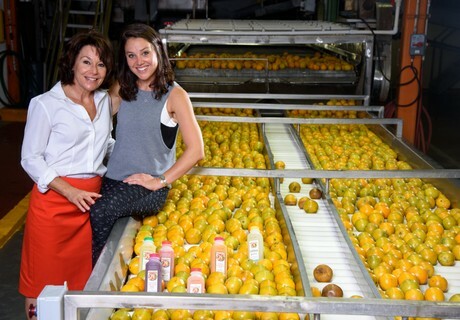 As Sexton set out to make a way for herself in Florida's most competitive industry, she remained true to her mission: she simply wanted to provide healthy juice to her family, made with the local fruit they had so proudly grown for generations. She knew that if it was good enough for her children- there would be other families that would want it for their children. From the very first order that Sexton delivered, by borrowing the local butcher's refrigerated truck, she knew she was onto something that set Natalie's Orchid Island Juices apart from every other juice in the industry. Sexton's 'can do' spirit, got the company off the ground quickly, and America's appetite for fresh, clean label juice from the Sexton family, has continued to explode for the past 27 years. What started as a mom's dream for her family, is now an award winning leader within the juice industry. Natalie's can be found in over 30 states and 32 countries around the world and the company recently became certified as a Women's Business Enterprise by the Women's Business Enterprise National Council. As Natalie's continues to grow, they proudly welcome the second generation of juicing experts. Now Natalie, the baby in the groves that autumn day, and the namesake of the company, is helping her mother provide healthy juice to a whole new generation of customers. Under the watchful guidance of the Sexton women, Natalie's Orchid Island Juice Company continues to be committed to hand crafting and delivering the highest quality, clean label juice to people throughout the world.